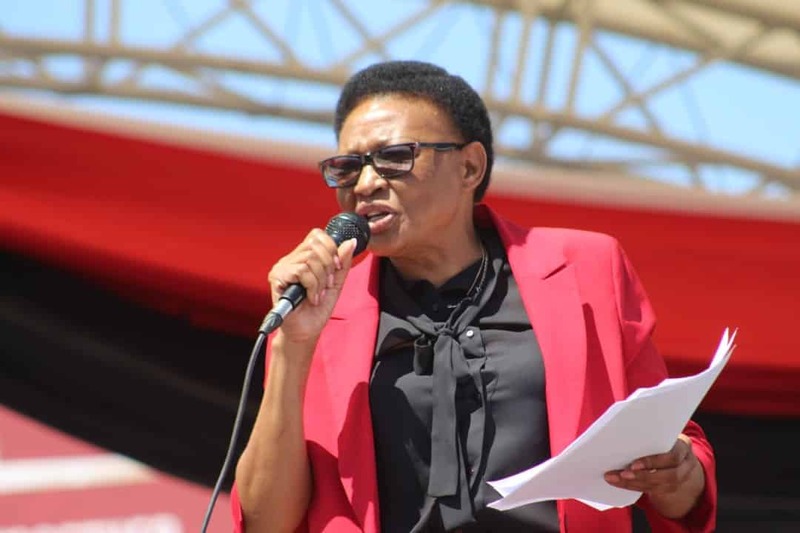 The opposition MDC chairperson Thabitha Khumalo is fearing for her life following an alleged crackdown on civic society and opposition leaders by state security agents over last week’s bloody shutdown called by the Zimbabwe Congress of Trade Union (ZCTU). The shutdown turned violent with protesters barricading roads and looting from shops resulting in the security forces responding with heavy handedness. Opposition leaders among them MDC national organizing secretary Amos Chibaya and a number of councilors have been locked up charged with subverting a constitutional government. Hundreds have deserted their homes in fear of victimization by the state security forces understood to be carrying nocturnal operations hunting down looters and protesters. In a telephone interview with 263Chat late yesterday, the Bulawayo senator charged that armed security forces stormed into her house in Bulawayo looking for her. “We did not call for the stay away. What we did was to encourage our members in solidarity with our mother which is the ZCTU to support the ZCTU cause. And sadly what is shocking again is we have Charity Charamba coming with a presser, where she revealed that the people that are shooting and beating up people are criminals who stole army uniforms. “…who manufactures those uniforms? It does not make sense. They are trying to destroy the MDC in as far as I am concerned. It is something they have tried to no avail for the past 19 years,” Khumalo fumed. Asked to comment on President Mnangagwa’s spokesperson George Charamba remarks that the violent protests that engulfed the country last week were instigated by MDC leader Nelson Chamisa who fears electoral loss at the party congress set for October, Khumalo said Zanu PF’s divide and rule tactic will not succeed unless if it were the early days of the opposition formation. “Zanu PF plays a divide and rule tactic. If it was in the 2000s I would have said they have succeeded. This time it’s different. President Chamisa is now our best foot forward as we speak,” she added. Meanwhile, the situation has relatively improved in the capital today with a considerable number of shops opened and motorists turning up.